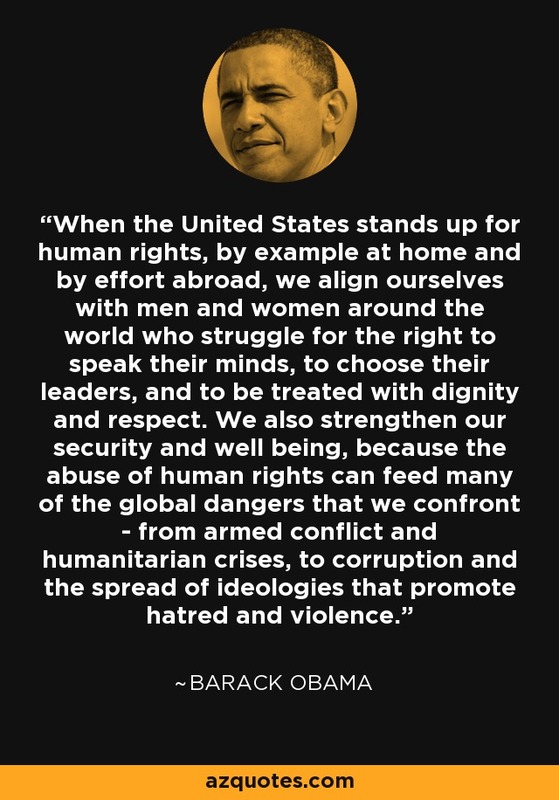 When the United States stands up for human rights, by example at home and by effort abroad, we align ourselves with men and women around the world who struggle for the right to speak their minds, to choose their leaders, and to be treated with dignity and respect. We also strengthen our security and well being, because the abuse of human rights can feed many of the global dangers that we confront - from armed conflict and humanitarian crises, to corruption and the spread of ideologies that promote hatred and violence. "Beatings, Protests, Arrests Mark 60th Annual Human Rights Day". www.huffingtonpost.com. January 10, 2009.